July has been a difficult month for a warming Planet Earth. Record heat was recorded across much of the globe and fires burned above the Arctic Circle. Here in the western part of the United States, dozens of wildfires are burning. One of the biggest of those fires, the Ferguson Fire, marched 20 miles to my house. The first 10 years of my life were spent living at the end of a mile-long dirt road in the mountains of Mariposa County. My family home is tucked up against the National Forest boundary at about 4,000 feet. My Dad and his wife live there. It’s a beautiful spot. Looking across the central valley at sunset is magical; as is the cool air rushing down the mountain at night after a hot summer day. An abandoned stage coach road to Yosemite runs right through our property -- still visible even though no stage coach has rolled through the area in well over 100 years. The Miwok Indians used to live here too. You can still see their acorn grinding holes in the granite rocks and, if you are really lucky, you can find an arrowhead on the ground after a rain. There are regular visits from bobcats, coyotes, and deer – as well as the occasional sighting of bears and mountain lions. But it is also rough country. It is steep and rugged, with thick brush. In the summer it has always been hot and remarkably dry. Over the past years, the summer has become hotter and dryer. And the summer has become longer. Weakened by drought and heat, the trees became susceptible to beetles. Now most of the pine trees in the forest are dead. Growing up, there would be an occasional nearby wildfire. The fires could be scary and big, but they were relatively infrequent. Not anymore. The wildfires have grown bigger, scarier and they come nearly every year. 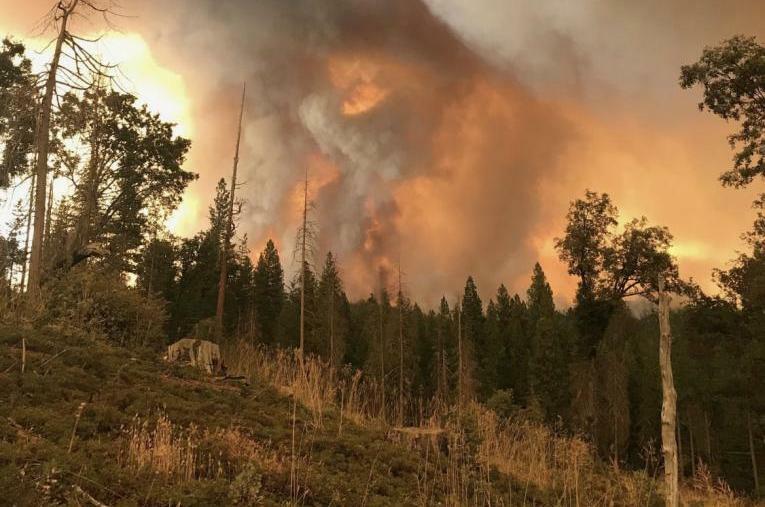 Last year, the Detwiler fire burned over 80,000 acres and 61 homes. That fire came within a few miles of our house. A few years before that, the Rim fire decimated 400 square miles up the road along Highway 120. This year, the Ferguson Fire started on July 13th near highway 140 -- about 20 miles from my home. Two weeks later, it had burned its way through containment lines and arrived, literally, in my backyard. Hundreds of firefighters worked for days to try and save our home. Air tankers were dropping fire retardant so close to the house that it partially colored the house pink. Our closest neighbor, a quarter mile from the fire line, said the fire was so intense that 6-inch pieces of flaming tree were landing at his house. Two firefighters have died battling this fire. Welcome to the new normal, except it is going to get a lot worse. What we are seeing in California is what has been predicted by scientists for decades. This is what climate change looks like. Climate change can seem remote – something we will experience in the future or that will affect other people in far-off places. But climate change is not only “real”, it is now. And it is right here. My family was lucky this time. Three days of heroic work by firefighters paid off. Our home survived. Soon, when the evacuations are lifted and the ground has cooled, my Dad and I will drive up to survey the damage and plan for the future. It will be a future that looks a lot more like last week than we’d like to admit. And then, I will join my colleagues back at Renew Financial – where 300 of us are working hard every day to help America transition to an energy system and an economy that isn’t making the problem even worse. There is so much at stake. And we don’t have much time to act. But today, I want to focus on the people at the front lines of this fight: The firefighters and other first responders, the disaster relief teams, and the other community groups helping those that have been displaced by the fires or extreme weather. I hope you can lend some support as well.